Nationalism was the defining organisational principle of the 20th century – from Nelson Mandela and the African National Congress right the way through to Adolf Hitler and the National Socialist German Workers Party. But the age of nationalism, of all those sorts of nationalisms, as we have known them, is drawing to an end. We see that in Scotland. No echt 19th or 20th century nationalist movement would have accepted the native-born being out-voted by the ‘foreign’ born as the Scottish national movement did in 2014. That meekness (or quiet strength) holds the clue to the future, and I will return to it. We know that the old internationalist views of the left don’t describe the world as she has been. The workers of the world did not unite based on their relationship to the means of production. Political struggle is based on the twin base of nationalism: of institutions and ethos. In the 20th Century there were struggles for social justice within the bounds of Britain, largely but not entirely, untrammelled by the indignities that empire imposed without. People have personal needs and aspirations that are expressed by groups, and those groups map, always imperfectly, onto institutions. Europe was roiled by institutional and group conflict, driven by an ethnically exclusive nationalism of one-people-one-state. The European Union is the institution most shaped by that, most designed to counter that. So what does the ‘nationalism’ of today look like? We can split the world in to passive nationalist and active nationalists. For passive nationalists the institutions they currently have are fine, and the political struggle is purely about ethos, what they wish to achieve within those institutions. The active nationalists are those who wish a different institutional settlement. God knows we are all bored by discussing the SNP here, so lets look at the other nationalisms of Scotland. The passive nationalists can usually plausibly deny their nationalism – the old John McTernan line “the fact that there is no such thing as British nationalism is what makes this the greatest country in the world”, and if that fails fall back on “patriot but not a nationalist”. Brexit throws this all up in the UK. A great bubbling up of active nationalism and new institutional hopes – British nationalism, English nationalism – a sort of Brenglish nationalism if you like. Now the SNP are sitting back as the passive nationalists, defenders of the EU, the status quo. The opposition are out on manoeuvres, all tanks and flags, all rousing speeches and enemies of the people. It’s fun to be honest, pointing and laughing, I could get used to it. What is interesting is how the debate about the new institutions these nouveau nationalists demand illuminates their ethos, for so long denied. Of course foreigners shouldn’t have the vote, even if they live here. How terrible it is that the other European politicians disrespect us with their negotiation tactics. The consent of the devolved administrations is in no-way required. But there are deeper terrors lurking. One of the great unintended reveals is the continued calls for ‘like now but better’. We need to replace the old, hideous, destructive customs union with a new better, identical customs union. We must throw-off the enslavement of this terrible court and replace it with a better, identical one. These arrangements are terrible and a black-affront, they must be replaced with these identical ones. It all boils down to the same thing: a Customs Union or European Court or any other arrangement of 28 must be replaced by one of 2. The key is given in what the Financial Times wrote about the director of the Centre For European Reform. When Nebuchnezzar built Bablyon he had his face and name stamped on all the mud bricks. When Saddam Hussein restored it, he insisted on bricks with his face and his name. This is the Brexit project – tear down the old buildings, with the bricks of Monnet, and rebuild them, with new bricks: with John Bull on one side, and the Queen Mum (Gawd Bless ‘Er) on the other. These new institutions fix the disconnect between the dominant Brenglish ethos and the current institutional framework. It is unthinkable and wrong that the UK is an equal to other European countries, to mere Belgium, Bulgaria and Spain. It is an affront to ‘us’, a psychic castration for ‘us’ to be cast down so. ‘We’ are a world power and ‘we’ seek our peers. For this conversation not to sound totally mad, it is necessary to elevate the European Union to ‘our’ level, to be a worthy protagonist. As frothy British nationalists talk up Britain, so they must talk up the ‘European superstate’. Alexander ‘The Piffle’ Johnson MP mugs through WWII films in his press conference charades: behind him a flotilla of the lesser outraged, the EUSSR men, the very dregs of Twitter and even the once sane, chewing carpets all. The poor old EU only has 25,00 civil servants, no police, no army, no muscle. It is a puffed up cartoon villain: the giant marshmallow man of Ghostbusters, willed into existence in the fevered minds of its enemies. As Ireland is called again to fall within the British ‘sphere of influence’, then Slovakia must be in Germany’s, must be, has to be, is, definitely is. The tragedy of The Protocol Of The Elders Of Zion is that there wasn’t actually a world conspiracy when the poor Jewish people really bloody needed it. After 60 years of integration-by-stealth, of sapping the minds of free men with straight banana regulation, of all the tricks and tropes of Johnny Foreigner, this European Economic Conspiracy has built itself up to be just 3 times the size of the United States Secret Service. Alas, sans guns, sunglasses, flash suits and action fillums. Sadly in a straight fight between the massed myrmidons of the EU and Donald Trump’s personal bodyguard, my money wouldn’t be on the EU. The fevered man fights the fever dream, in which the EU laughably appears in a daze of chimerical collapse. Us Europeans are left here wishing the European Union had a little more of that lurid projected phantasmal power. The flight from complexity at the heart of Brexit draws its inspiration from English history, the buccaneering mercantile spirit, a new Elizabethan age, the corn laws. If we can do what we did when last we were great, we will be great again – Saddam and his Babylon, an old story. A lot of simplistic nonsense about a bonfires of red tape and quangos, and privatisation has driven debate about the efficiency of the state, and the particular iniquities of Europe for the last 30 years and needs to be put to bed. Were you to print out this ‘red tape’ the pile would stand well over the height of a normal person. No single living person has read it all, let alone understand it, and not just because nobody understands 100+ human languages. Excellence in the management of complexity is a social, organisational and operationally cultural condition par excellence. The protean British impulse to ‘deregulate’ comes from a terror of incomprehension – the cut down world is ‘easier to understand’. The problem, of course, is that without the ‘red tape’ the iPhone is substantially a brick. But how does the end user experience this complexity? Paradoxically as simplicity: point, click, call, press and swipe. It is our belief in the SNP that the best way to manage the relationships between different (and neighbouring) nations is via a light organisation of governance (not government). One that allows national governments to co-ordinate and co-operate under ministerial guidance, with democratic oversight and impartial judicial arbitration. This co-operation should include mutual cultural, political and economic rights of a footloose citizenry. These relationships should foster deep, continental, open commercial markets, but also support a strong social contract for our people and the modern and appropriate tax base that are required for that – it is a challenge of managing complexity. The European Union is an exercise in just that: examination of regulations, reciprocal rights, shared enforcement of agreements under law via the European Court of Justice and all the endless, dull, dull, dull and un-buccaneering regulatory harmonisation. And how do we as European citizens experience this complexity? As greater simplicity, as freedom: go to Germany, buy a house in Germany, get a job in Germany, vote in Germany, go to Spain, buy a house in Spain, retire to the sun. But the process of flight from complexity brings with it new realisations. The UK wrenched itself out of Euratom without even taking submissions from her atomic scientists. The damage to British institutions is tremendous. Who will fight for this broken thing now? Who would be afraid of it? For the time of fence sitting, of “I am neither a British nationalist nor a Scottish one, a plague on both your houses” is over. Brexit has made worms’ meat of you. During the General Election, Mrs May sent 3 people into a room to rethink social policy. When they came out it blew up taking the Tories election lead with them. The once-Great Repeal Bill repeats this process – letting ministers and their conclave rewrite regulations and make them law – but not for one policy, for 14,000. The idea that the battered and discredited Parliament on the Thames come out of this without further crises is a for the birds. Constitutional change is back baby, on the Thames, the big cahuna. And the time of institutions and ethos and their struggles is for everyone. Geography won’t change, Scotland and England will still have a border and close relations: whether indy-ish or union-ish or federal-ish. But now everybody has to have an opinion on institutions. Le jeux sont faites. We Scottish nationalists are also challenged though – but the challenge is to our ethos. The old one-people-one-state assumptions meant the people coming and living here must assimilate – the new world does not. What does it mean if we have 30,000 Spaniards in Edinburgh? They can get books and TV and culture in Spanish off the internet, but should not their children be able to be taught in Spanish at state schools? It is only in the last 100 years that Europe’s cities became mono-national. Great living cities pull in people and are multi-national, and that is a nationalism we should embrace, we have embraced. The Lord Provost of Glasgow, the first citizen of the first city of Scotland is Swedish. Her Depute, from the Labour Party, is Flemish. But we in the national movement cannot reasonably talk about a Europe of 4 UK’s, 2 Spain’s, 2 Belgium’s and 3 Italy’s as a good thing without also recognising that the Europe of 30 years time, could (and should) be an EU of 4 Scotland’s. The Isle of Man sits where she does with her own parliament, and Orkney and Shetland as they do, without, because of some feudal fart of history, lost in time. It is not even clear where, after Scottish independence, Man would go: once feudal property of the Scottish Crown. A world in which Orkney, Shetland and the great Gaeldom-restored of Alba sit alongside us in the European Union is not unthinkable, indeed should be thought. These ‘foreign’ Gaels would ‘swarm down’ over the border to our great Universities in Glasgow (as they do now) bringing their poets and their singing (as they do now). The earth would orbit the sun (as it does now), the trains would sing along the line to Mallaig and Oban still. Finland and Norway are two of the new European nations of the 20th Century, getting their independence in 1905 and 1907 respectively. Once both were under Swedish dominion, Finland latterly under Russian control. They found themselves on opposite sides in the Second World War. But for Finland’s 100th birthday Norway gave serious consideration to giving her neighbour a mountain – the peak of Mount Halti, a new highest peak. A simple shift of the border by 31 meters. The bony fingers of 20th century nationalism clawed the gift back. We, but can I talk of we? or only me, lowlander, Trinidad-born, Edinburgensian? … I in Scotland am not so constrained by the past, why should I not give Gaeldom my hand, and you yours, or the taking of mine? Such a gift, given in such a way, is not even gone. A country, a nationalism, that lets the foreign-born vote as we did, is a country that could give a mountain away, is a nationalism that has already given a mountain away. But a nationalism that denied its ‘foreign’ residents their vote, as Brexit did, can not, have not and could not. * We really need your support to develop though and we’d like to ask you to support us by donating to us here. We’ve got big plans to launch our new site, to launch new publishing and events projects, and to extend our platform of writers – but all of this needs your support. Nothing will change in the isles of Britain for as long as the London establishments continue to rule. Perhaps that is what most people want. There is a great deal of bull being written about nationalism these days in Scotland it seems to me. Scotland is one of the oldest countries in Europe. It’s older than Italy, it’s older than Germany, it’s older than Spain and it’s older than the Netherlands and Belgium. Off the top of my head, only Portugal is older than Scotland, which dates from the end of the 13th compared to the beginning of the 14th for Scotland…about 20 years difference. Why do have to keep defending Scottish nationalism, and at such lengths, with so many acrobatics? Because of the machinations of the MSM I guess. If we want to be wary and cautious about nationalism, and why not, there is an easy check list. It is based on ethnicity? In our case, clearly not. There is not even a distinct linguistic issue at the heart of Scottish nationalism. Is it inclusive or exclusive? Clearly it is inclusive in the case of the SNP. 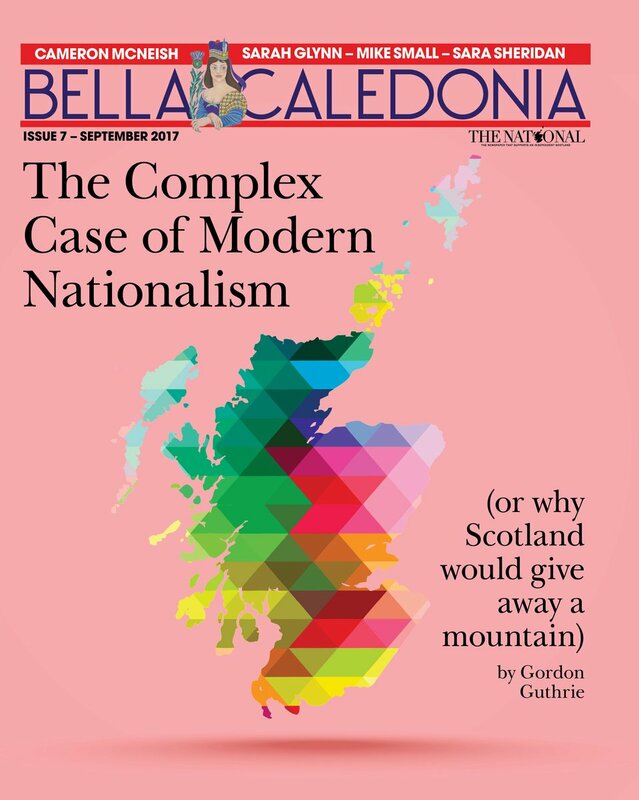 The irony about the 19th century nationalism which is still being used to attack the SNP is that it grew out of a literary movement called Romanticism. Scotland pre-dates the word “nationalism” by about four centuries…. I see the yes movement has well and truly retreated to the navel-gazing phase now. I think the issue of who can vote in a referendum is not that unusual. You can see it in Ireland, where voting is restricted to those who are resident – there are very many other Irish people who could claim citizenship, but who do not live there. They don’t get the vote. The Scottish referendum had something of this. There are a lot of ex-pat Scots (in rUK and elsewhere), and Scots by family association, but who don’t live here. They didn’t get the vote. The EU takes a similar approach – EU citizens are eligible to stand and to vote in municipal and European Parliament elections wherever they are resident, but not to take part in national elections. But more interesting for me that this is taking a tack away from institutional change towards one of ethos (or ethnos). Independence and self-determination of a people and territory is not about ‘nationalism’. To a large degree, independence for Non Self Governing Territories (e.g. Scotland) is about ending what the UN still refers to as the “scourge of colonisation”. Independence is about freedom and liberation from oppression by an ‘administrative Power’. Those who actively vote to prevent or block Scotland’s people’s independence and liberation/freedom tend to do so for ‘nationalistic’ reasons. They are ‘nationalists’. We are not. Superiority and subordination are traits of the colonialists and colonised respectively! It does not usually end well for the colonialists, you’d think they’d learn from history? Dear Blair, Both our entries seem to assume that folks who do not live in Scotland are unworthy of consideration as voters – and also suggest that folks living but not born here might also be denied rights. You may wish to discount my personal claims to rights because I had a great grandfather born in Ireland. Nevertheless this response assumes my background as a wild young Glaswegian in the ’50s (author of RETIRED TERRORIST) may qualify me to make the assertion your views are somewhat simplistic. I haven’t returned to Scotland in the more than 60 years since my exile (the SNP didn’t help me… and I didn’t bother making challenges to civil justice authorities). The SNP National Secretary Robert Curran (who was my friend and had helped plan the offending escapade but had not been a physical participant) was allowed by his SNP colleagues to return to Edinburgh after a couple years exile in N.Y. I won’t confuse this by indicating my hiding place! I’ve simply made these comments to express my opinion that your assertions do little to help the cause (and to take this opportunity to remark upon the fact of their format – I’ve indeed suffered from having suffered two very lengthy sentences)!